Most people who suffer through traumatic events do not recognize the real effects that those experiences will have later in life. In many substance abuse cases, patients uncover those effects through counseling and begin to understand the role that their past trauma plays in their current situations. Effective treatment for substance abuse often hinges on caregivers’ ability to address mental health issues and past trauma in order to open the door to a full, positive recovery. Many people who suffer traumatic experiences, especially very early in life, subconsciously suppress the memories of those events. Quashing a memory does not eliminate the effects a traumatic experience can have on the human psyche. The symptoms of the trauma will often show up in many different aspects of the individual’s life. Most often, people tend to deal with the feelings of past trauma by self-medicating with drugs and alcohol. Once trauma and drugs and alcohol become entwined, a trauma-informed approach to addiction treatment is needed. Trauma and alcoholism often go hand-in-hand, as trauma survivors will turn to this substance for relief. Alcoholism is one of the fastest-progressing forms of substance abuse that can quickly become life-threatening. Why are trauma and alcohol use so closely linked? Honestly, alcohol does numb the symptoms of trauma – for a short time. Alcohol can help you to lower your defenses, make you feel a sense of euphoria and forget the trauma of your past. While you are drinking, you can almost feel what it is like to be free from the chains of past traumatic experiences. Alcohol might even feel like the cure to many of the problems you have in your daily life, so of course you would want to self-medicate with alcohol and continue to feel good, right? Unfortunately, alcohol is not a miracle cure for the emotional distress you feel, and only masks your true feelings temporarily. Believing that alcohol is the best way to address these feelings of depression, shame and anger can start you on a dangerous path where you need alcohol to continue to put real problems to the side. Alcohol abuse always leads to the same place: alcohol use disorder and physical dependence, which sooner or later stop numbing the true problems and leave you only with the same problems plus the very big problem of alcoholism. While some people can pinpoint their traumatic experiences, others may not realize the effects of past traumas or simply do not remember them. It is not necessary to remember a traumatic event in order to feel its effects later in life, however. One-time events such as a natural disaster, suffering a violent assault, or a car accident. Ongoing stress from sickness, persistent abuse of any kind, or living in a dangerous place. Overlooked causes such as suppressed memories from early childhood, sudden loss of a loved one, or public humiliation. It is important to remember that each individual is unique, and an event or issue can be non-traumatic to one person while being completely debilitating for another. Even the individual suffering the trauma may be struggling to accept that the trauma had any effect on them whatsoever. This often leads to shame or resentment, which furthers the negative effect and worsens the problem. Treatment of substance abuse involving trauma requires several goals. First, a safe and compassionate environment must be established in order for the individual to be open to sharing the root causes of trauma with the counselor or therapist. Therapy is a two-way street, and the individual must not only be willing to open up to let out the past experiences, but must be willing to allow help back in and be open to the treatment that will give resolution to the traumatic feelings and events. The treatment must empower the individual, not alienate them or make them feel any sort of shame for their feelings. A trauma-informed approach to therapy should not only empower the person, but also should not label or pathologize them. Labeling the person or generalizing their symptoms, needs or feelings can actually worsen the trauma. In turn, many of the therapies used in general addiction treatment may not help a individual suffering from trauma, and they could cause even more harm – and deepen substance abuse problems. Many relapse cases can be tied to this inadequate type of treatment for trauma. Psychotherapy is the most effective treatment option for trauma survivors. Through counseling and therapy, trauma victims will learn to process their traumatic memories in healthy ways and develop new coping strategies. Effective trauma counseling also helps patients learn to identify their triggers or the external stimuli that can cause negative symptoms like anxiety, depression and the urge to self-medicate. Most treatment plans for trauma-based dual diagnosis cases will involve a healthy mix of therapies and counseling structures. Some patients will benefit more from close one-on-one counseling while others thrive in group counseling environments (as long as the group therapies also utilize a trauma-specific approach). Whatever form treatment takes, caregivers must be able to connect to each patient on an individual level. There is no one answer to trauma cases, and substance abuse professionals must be flexible and committed to each individual patient’s recovery process. 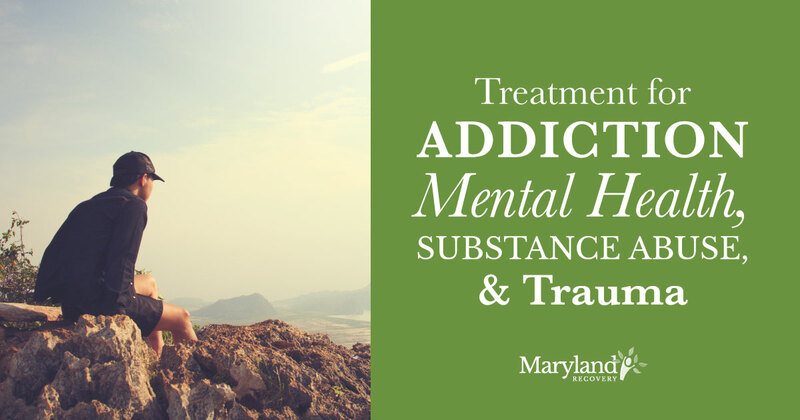 The Maryland Recovery team understands the need for close individual counseling and a trauma-informed approach to substance abuse treatment. Many dual diagnosis patients do not receive effective substance abuse treatment and are more prone to relapsing than other rehab graduates. The risk of relapse is especially high for trauma survivors with substance abuse issues. Our team takes a unique approach to outpatient treatment and offers flexible treatment schedules. Many people who have completed detox or even residential substance abuse programs find that our trauma intensive outpatient program (IOP) provides a more robust standard of care that few other facilities can provide. Overcoming trauma and substance abuse is possible with the right treatment plan. At Maryland Recovery, we know there is no one answer to dual diagnosis cases involving trauma, which is why we develop robust, individualized treatment plans for each and every patient. Instead of risking rehab with an ineffective or incomplete treatment plan, come to Maryland Recovery for the individualized care you need to recover properly. This entry was posted in Mental Health and tagged Dual Diagnosis, Intensive Outpatient (IOP) Treatment, Substance Abuse, Trauma on October 23, 2017 by mdrecovery.